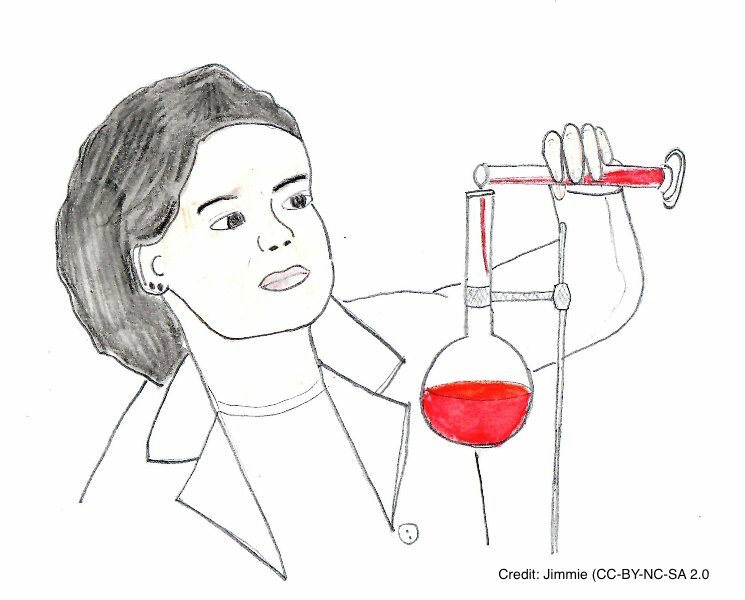 Some scientific journals are asking authors to prepare a graphical abstract to be submitted along with the manuscript. Graphical abstracts can help attract readers to your papers. In my opinion, it is worth the time and effort to craft them. In this video tutorial, I talk about the benefits of graphical abstracts to the author and briefly show how to prepare one. This and other writing tutorials are posted on my other YouTube channel. I recently launched a new YouTube channel focused on scientific writing. Although I’ve written several essays about writing (How I Wrote My Best Scientific Paper, How to Write a Scientific Abstract), I knew that a lot of people dislike reading long articles. More and more people, especially students, like to get their information by watching brief videos. So, I decided to begin sharing what I’ve learned about writing over a forty-year career in a series of videos. 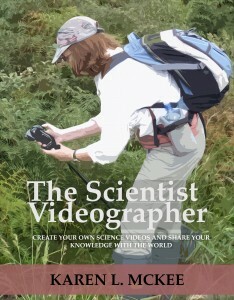 I’ve been making video tutorials about science videography for six years now. So, using video to share insights about writing was a no brainer. The only question was: What video format would work best for this particular topic? I decided to try something simple and that would make it easy to cover a lot of material on camera. I used my computer camera and an external microphone to record these videos. I had my script or list of main points on my computer screen where I could easily see them. The trick is to deliver the material in a natural speaking voice and avoid the shifty-eye syndrome. That’s easier said than done. But I thought I would try it for a while and then in a future post offer some insights into what works and what doesn’t. Many people get their impressions of scienti sts and what scientists do from the movies. Film can depict the realities of careers in science and technology while telling a story about the characters who happen to be scientists. Film is also important in developing and perpetuating society’s myths about scientists. We are all familiar with the cliché of the mad (typically male) scientist in fictional film. But what about female scientists? 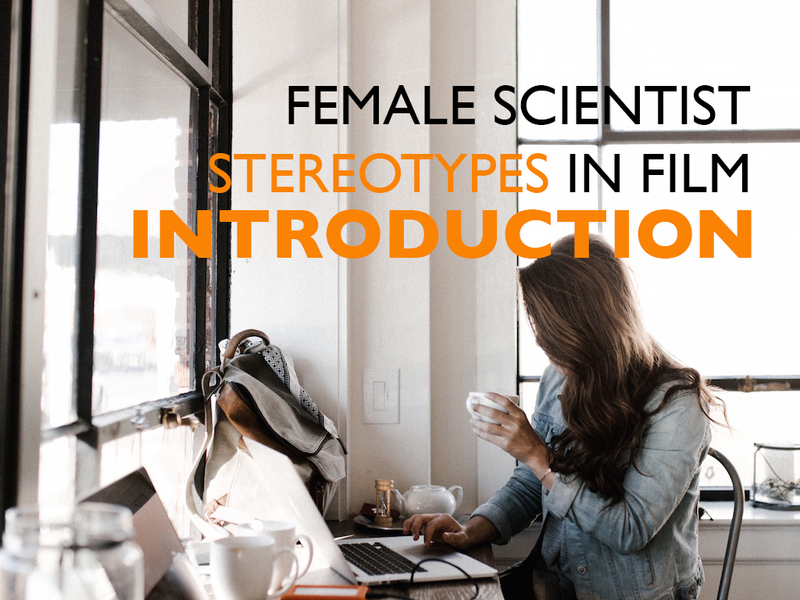 In a new video series, I explore six stereotypes of female scientists seen in the cinema. All of these videos are posted on my YouTube channel. 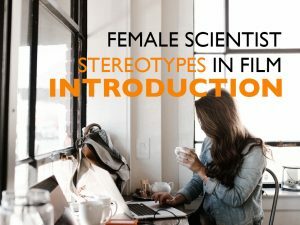 I used examples from the movies to illustrate each stereotype, but as you’ll see, I did not use clips from the original movies, but instead created the videos using images in the public domain (or otherwise free to use). I took this approach for several reasons: to avoid any copyright infringement claims, to challenge myself to create videos using only still images and voiceovers, and to aid the viewer in envisioning these stereotypes beyond the specific movie examples I offered. The film opens with a time-lapse of an astronomical observatory framed against a backdrop of stars rotating slowly overhead in the night sky. We hear foreboding music that suggests the inevitable passage of time. Then we see astronomers at work inside the observatory gathering data from various sensors and arrays aimed at nearby asteroids, distant stars, and far-away galaxies. Throughout the night, the scientists and staff deal with routine problems such as a faulty temperature sensor. Meanwhile, the telescope camera is methodically snapping images of celestial objects. 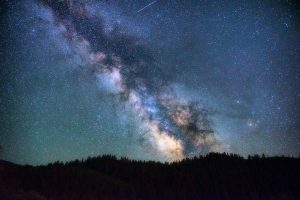 The next morning, a young researcher notices an unusual visual pattern in the night’s data—a curved distortion in space that resembles a bow wave generated by a ship moving through the ocean. Such interstellar phenomena are called bow shocks. But this one seems to be different. She takes her discovery to the director of the astronomical institute, who is taping a public service video about their new telescope and state-of-the-art camera, which captures the telescope’s entire field of view and creates a tridimensional cartographic image of the sky. After she finishes recording the voice-over for the video, the director tells the young scientist to put her images from last night’s work on screen. They watch as the computer stitches the images into a time-lapse view of the bow wave moving diagonally across the starscape. The young researcher estimates that it is traveling at about one third the speed of light. More calculations reveal that the bow wave is passing through the Oort Cloud in the outer reaches of our solar system. Whatever it is, it’s right on our doorstep. Then, the director points out something really astonishing…the bow wave appears to be slowing down. Although the scenes depicted above are fiction, they were filmed at a very real observatory, newly built for the purpose of wide-field optical surveys of the universe—the Observatorio de Astrofísico de Javalambre located at Sierra de Javalambre in Teruel, Spain. The film, entitled “Bow Shock” is a collaboration between filmmaker Javier Diez and scientists from the Javalambre Physics of the Accelerating Universe Astrophysical Survey (J-PAS). It was screened at the 2016 Imagine Science film festival and later archived at Labocine—a platform for new-wave science films. Watch it here: Bow Shock. We are all familiar with science fiction films, which often take us to the edges of human imagination: The Day the Earth Stood Still, 2001: A Space Odyssey, Blade Runner. Alien. But Bow Shock belongs to a new genre called “scientific fiction”, which is a cross-fertilization of science fact and cinema. Emphasis is on getting the technical details right (something Hollywood often fails at) while telling a compelling story (something Hollywood excels at). In this particular film, the observatory and its research goals are real, but the story being told (about the bow wave discovery) is fictional. The idea is to provide an accurate account of the science while telling an intriguing story of how scientists of the future might use this new observatory to spot evidence of extraterrestrial life or other celestial phenomena. It’s an interesting approach that, in my opinion, has a lot of promise. Bow Shock is a good example of scientific fiction—in this instance with actors playing the parts of scientists and observatory staff. The film is technically sound, well made with eye-popping visuals of astronomical techniques, and tells an intriguing story. Information about the observatory’s unique telescope and camera system is cleverly conveyed in the fictional story by having one of the characters record a public service video summarizing key features of the system. This approach is much more palatable than having a scientist give a dry, awkward speech on camera to introduce the observatory and its equipment. The fictional story about the bow wave does more than capture and hold the viewer’s attention while the more technical aspects are presented. It illustrates how astronomers look for unusual patterns in data collected with telescopes. By featuring the bow wave phenomenon, the film not only shows how astronomical research is conducted, but also how the observatory might make important discoveries in the future. Of course, the biggest discovery would be to find signs of extraterrestrial intelligence. The film hints at this possibility, and the scientist actors speculate about how First Contact might occur and what response we might expect. This focus on First Contact takes advantage of people’s fascination with the question of whether life exists outside the Earth. There’s also a bit of historical irony in the film when the Spain-based astronomers recall what happened when Spanish conquistadors encountered the people of the New World. The analogy between early (Spanish) explorers sailing the oceans in search of new trade routes and spacefaring aliens sailing across the galaxy suggests to the viewer some potential outcomes based on known historical encounters. In other words, the film gives the viewer a lot to think about, but without resorting to exaggeration of the science. Using scientific fiction to convey information about science is an interesting idea. Scientists often struggle to talk about their research in a way that is both understandable and appealing to the average person. Scientific fiction might be helpful in this regard, especially to show how a line of research might lead to breakthroughs in the future. By taking this approach, science filmmakers can spark people’s imagination about what discoveries a line of research may reveal. Humans are hard-wired to get their information in the form of a story. And, making such a film could be a lot of fun. Bow Shock was made by professional filmmakers and actors, but such a film could be made by a group of scientists or science students collaborating with film school faculty and students, for example. The scientists would ensure that the technical details were conveyed accurately, and the filmmakers would provide the cinematic expertise and acting talent. Coming up with a fictional story that is scientifically accurate would be challenging, but could be enlightening for the scientists involved. For more examples of scientific fiction films, check out the Labocine series. Of course, you don’t have to make up a story to create a compelling film about science or scientists. In my next post, I’ll talk about taking a documentary approach to making films about science that resonate with viewers who otherwise have little interest in science. This is the first post in a series about Artificial Intelligence (AI) and how it might help scientists be better communicators. In this post, I introduce the topic. A scientist is working on a grant proposal and must create a three-minute video synopsis of what she plans to do with the funding and how her research will benefit society. This video synopsis is one of the required components of proposals submitted to government funding agencies. She logs onto a platform in the Cloud and uploads video clips showing her and her team working in the laboratory and talking on camera about the potential applications of the proposed research. An AI (Artificial Intelligence) system analyzes all of the uploaded information, as well as millions of images, animations, and video clips in the public domain. Within minutes, the AI system has identified the key components necessary to address the stated goals of the funding opportunity and has produced a draft video of the required length that is both intellectually and emotionally stimulating. The scientist takes the draft video file and makes a few edits based on her knowledge of the field and potential reviewers. She renders the final video and attaches it to her application package, which she submits to the funding agency. Her proposal is funded, and the funding agency uses her video synopsis on their website to inform the public about the research they are supporting and how it may affect them. Far-fetched? Perhaps not. Recently, I was watching an episode of GPS in which Fareed Zakaria interviewed the CEO of IBM, Ginni Rometti, and my ears perked up when they talked about an AI helping a film editor cut a movie trailer, reducing the time required from weeks to a day. The movie studio, 20th Century Fox, recently collaborated with IBM Research and its computer Watson to produce the first computer-generated movie trailer for the science fiction film Morgan, which is about, appropriately enough, an artificially enhanced human. Watson was trained to “understand” what movie trailers are and then to select key scenes from the full-length movie to create a trailer that would appeal to movie-goers. A similar approach could be applied to scientific information to produce a video proposal that resonates with peer reviewers and panelists, as in the hypothetical example above….or a video abstract to inform the scientific community about a recent journal article. The idea here is that a busy scientist may one day be able to use AI to rapidly scan a vast storehouse of data—much faster and more thoroughly than a human—and then to suggest the best material and design for an information product such as a video. AI is being considered as a way to enhance many activities involving the analysis of large amounts of data—such as in the medical or legal fields. Using AI to create movie trailers or science videos may seem to be a trivial goal compared to making a more accurate medical diagnosis; however, when you consider how important it is for science professionals to be good communicators, the idea seems worthwhile. In the coming posts, I’ll explore this topic further and provide a bit more detail about how IBM’s Watson was used to create a movie trailer. This post is part of a series about Artificial Intelligence (AI) and its potential role in science communication. In the next post (part 2), I’ll provide more information about Watson, the computer.